Wombat Security Technologies (Wombat), the leading provider of cyber security awareness and training, today announced the release of its “2017 User Risk Report,” which provides an analysis of admitted personal security behaviors of U.S. and U.K. workers that play a major role in securing information, devices and systems at work and at home. Wombat surveyed more than 2,000 working adults — 1,000 in the U.S. and 1,000 in the U.K. — about cyber security topics and best practices that are fundamental to data and network security, including mobile device habits and password security. The survey concluded less than 24 hours prior to the start of the public warnings about the WannaCry ransomware attack. 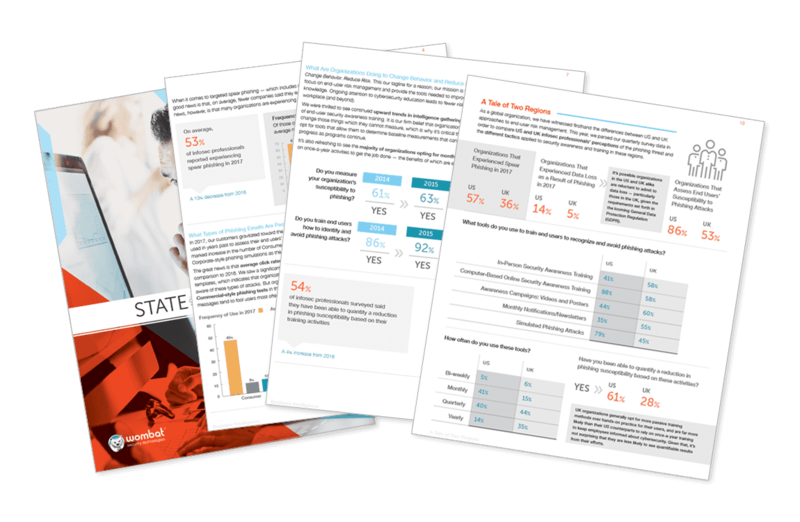 Wombat’s “2017 User Risk Report” found that half of U.S. respondents have been a victim of identity theft, compared to 19 percent of U.K. respondents. This discrepancy may be attributed to lax security habits of U.S. workers. For example, the survey found that 54 percent of U.S. respondents believe a trusted location, such as a nice hotel or international airport, indicates a trusted WiFi network, while just 27 percent of U.K. respondents shared this belief. Similarly, 58 percent of U.S. workers believe an antivirus software can stop a cyberattack, while 37 percent of U.K respondents held the same belief. Wombat also found that, while half of employees have a basic knowledge of phishing, 30 percent of workers do not know what phishing is, with 10 percent of respondents unable to provide a guess. Furthermore, researchers found that knowledge of ransomware was even more scarce, with 63 percent of U.S. respondents and 58 percent of U.K. respondents not knowing what ransomware is. These results reflect the findings of the latest “State of the Phish Report” from Wombat released in January 2017. Additionally, Wombat found that an alarming number of these same U.S. workers allow their family members and trusted friends to check/reply to email (46 percent), view/post to social media (43 percent), stream media (47 percent), shop online (48 percent) and play games (50 percent) on their work devices. To view the complete “2017 User Risk Report,” visit https://info.wombatsecurity.com/user-risk-report.